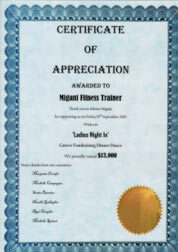 Migani Fitness Trainer’s promise is to be committed to consistently sharing knowledge. To uphold this we are in the process of designing fitness, life style and health articles for all its members to increase their knowledge. Remember, knowledge is only potential power; it’s what you do with what you know that counts! Migani Fitness Trainer is currently putting together motivation articles and blogs which aim to be updated weekly. Migani Fitness Trainer is in the process of designing YouTube clips which will not only demonstrate the exercise but explain simply what muscles groups are working, what you should feel during the exercise and how to increase intensity and possible progressions. Come back soon for updates on our YouTube Channel. Migani Fitness Trainer is always looking for ways to help in the community, in 2011 we ran multiple boot camp within local high schools and primary school for FREE and we have continued to do so. We orgainsed fitness camps at Caroline springs and have donated multiple vouchers to charity groups such as “LadiesNight In”. And of course if you’re looking for a trainer to conduct fitness sessions please contact us.